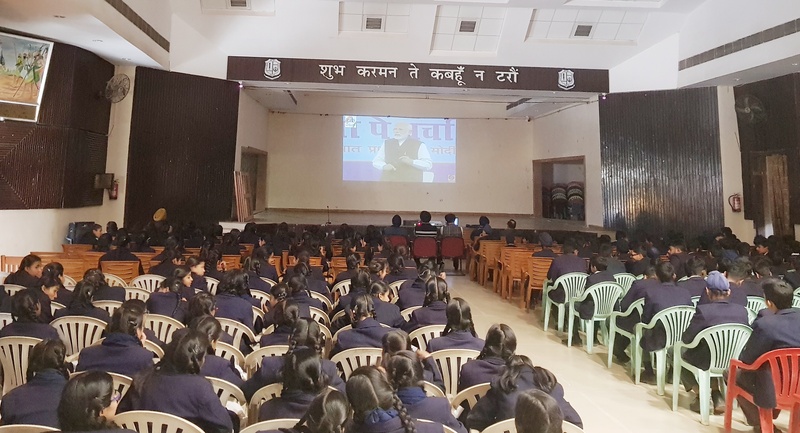 Ranchi, Jharkhand | January | 30, 2019 :: Guru Nanak Higher Secondary School organized a special program for the students of Classes 7 & 10 where they got the opportunity to hear “PARIKSHA PE CHARCHA” that was organized at the Talkatora Stadium in New Delhi. The students, through this, were made aware of the stress and burden that usually accompanies examinations and how to avoid them. It was discussed that it is due to the high expectations of the parents that students feel stressed and in turn unable to perform well in the examination. The Prime Minister suggested to the guardians should trust in the abilities of the student and realize that they are working at the best of their ability. Our Respected Prime Minister also talked about the fact that teachers and parents have to work together to provide a conducive atmosphere of education for the students ensuring that the students are able to achieve all that they are able to and are not burdened with unrealistic expectations. He also raised the slogan ‘Sabko Shiksha Achchi Shiksha’ which brings out the idea that students should be allowed to work on things that interest them I’m not just follow a predefined curriculum which promotes rote learning. Approximately 400 students who heard the Pareeksha Pe Charcha programmed were quite moved by it and resolved to study smarter and not only harder. With the upcoming examinations it would be a big boon for the students to be able to tackle the stress which is an obvious side-effect of examination. Along with the students a number of teachers with the Principal Dr.Manohar Lal and the Secretary of the school management committee Sd. Rajendra Singh were also present. The Secretary said that it was the responsibility of Educational Institutions to ensure that students are able to cope with the stress of Examinations and know how to approach them with a positive attitude, and Guru Nanak Higher Secondary School has been organizing various seminars for the same.